"Drawing from the latter years of the Beggars Banquet recordings (1987-1989), this set features often overlooked albums and a compilation of singles and alternative takes. 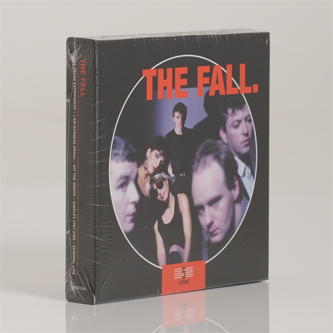 Out of all the late 70s punk and post punk bands, none were longer lived or more prolific than The Fall. Throughout their career, the band underwent myriad lineup changes, but at the centre of it all was vocalist Mark E. Smith. With his snarling, nearly incomprehensible vocals and consuming bitter cynicism, Smith became a cult legend in indie and alternative rock. Over the course of their career, The Fall went through a number of shifts in musical style, yet the foundation of their sound was a near-cacophonous jagged jumble of guitars, sing-speak vocals, and keyboards. During the late 70s and early 80s, the band were at their most abrasive and atonal. In 1984, Smith’s American wife Brix joined the band as a guitarist, bringing a stronger sense of pop melody to the group. By the mid 80s, the band’s British following was large enough to result in two UK Top 40 hits, but in essence, the group have always been a cult band; their music was always too abrasive and dense for the mainstream. ‘The Frenz Experiment’ reverts to the original vinyl version with bonus 7” tracks at the end. After the dark morass of ‘Bend Sinister’, the sound of 1988’s ‘Frenz Experiment’ comes as a bit of a shock. The arrangements are spare and broken down to the essentials, with the distorted guitars brought down low, and Wolstencroft’s drums high in the mix. Marcia Schofield had also joined the band to add keyboards. Their cover of The Kinks’ ‘Victoria’ marked The Fall’s first entry into the British charts, but also fitted in with Smith’s continuing explorations of Britain’s history and how it translates into issues of class identity. ‘I Am Kurious Oranj’ keeps the vinyl track sequence and adds bonus tracks and alternative mixes at the end. The last thing most Fall fans expected the group to do in 1988 was provide music for a ballet, but in fact this is what they did. Of course, it helped that the Michael Clark company of dancers were some of the most avant-garde at the time in Britain, inspired originally by The Fall’s ‘Hey! Luciani’ single. ‘Hit The North (Parts 1 - 6)’ includes all 6 released versions (four have never been on CD and one not even on vinyl) as well as an unreleased instrumental track (just in case you wanted more). Singles 1987 - 1989’ is a new compilation of singles tracks and alternate / unreleased versions. ‘Seminal Live’ is a hybrid album, featuring 5 new studio songs followed by live recordings from 1988. This is sequenced as the original CD."